Katuna Lodge stunning views of Mercury Is. 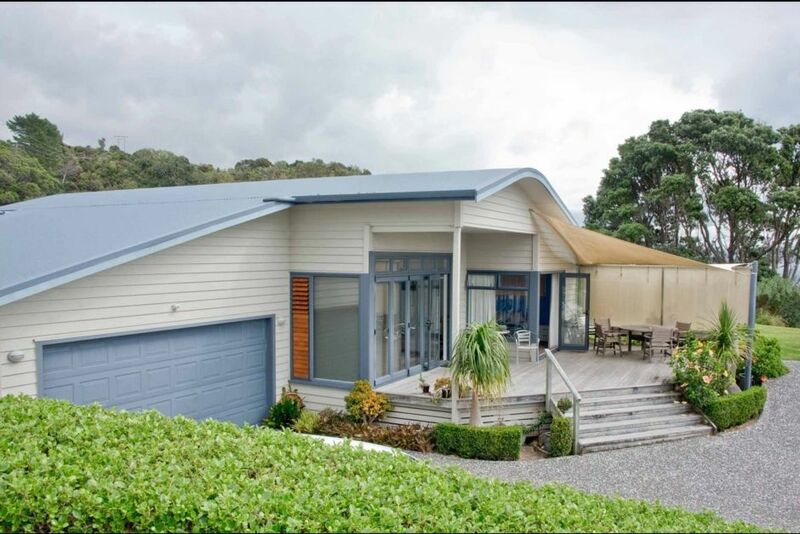 Fabulous architecturally designed holiday home with stunning views out to Great Mercury, Cuvier and Great Barrier Islands is situated on the hill side only 3 minutes walk to beach. Short walk along the beach to the general store for your kuaotunu killer,( a large icecream) . Next to the shop is Luke's Cafe for a LaLa coffee and cake or one of Luke's famous Pizza's.and evening entertainment. Great Atmosphere, well recommended. The bach has two double bedrooms, also set of bunks and four fold down beds in the garage, accessed off the kitchen, which also has the second bathroom. Cot and High chair available on request. Beautiful home with a view. Highly recommend with lovely welcoming hosts. Great house with everything you need for a getaway. Fantastic view and only minutes from beach. Highly recommend. The property is well kept and has everything you need, would definitely recommend. Amazingly clean and tidy, with beautiful views. Amazingly clean and tidy, with beautiful views. Great space for a family or just a couples retreat.